Enjoy this fun and free water safety event! 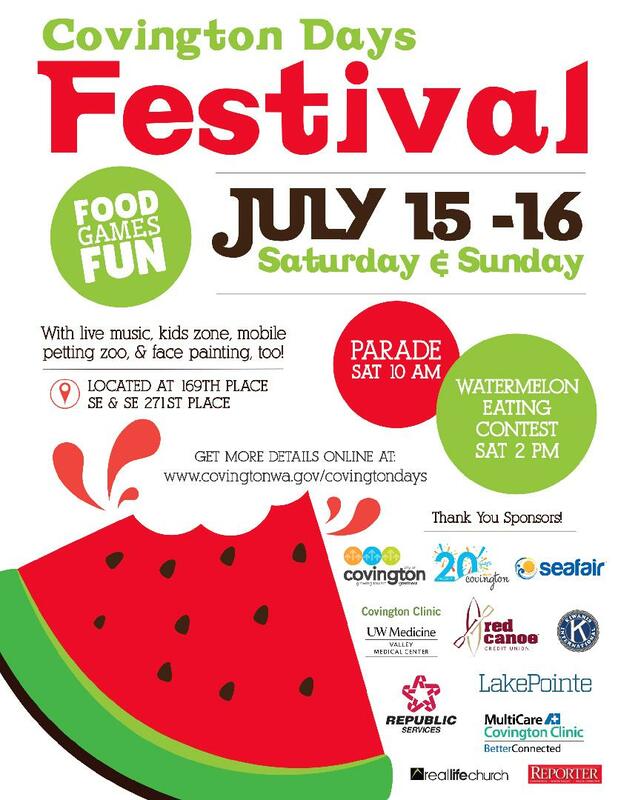 Saturday from 10 a.m.-7 p.m. and Sunday from 10 a.m.-5 p.m.
Covington's summer festival kicks off with the parade on 272nd at 10 a.m. At the festival, enjoy around 100 vendor booths, yummy food, live musical entertainment, the Kids Zone with inflatables and carnival games, a watermelon eating contest, and much more! Check out www.covingtonwa.gov/covingtondays for details. Its all for the kids! This fun event is full of hands on activities, crafts, inflatables, and much more. 9:30AM- 2k (Free if registered by Sept. 10) 10:00AM- 5K and 10K located at Kentwood High School. Come enjoy a healthy and fun Saturday Morn'- good music, fun booths, and professionally timed. It is fun & we are local; come visit the "Farmers Market" and bring home something healthy to cook! Summers End offers a 5K Fun Run/Walk, a 10K Fun Run, and a Youth 2K. All ages and abilities are welcome. Races start and end at Kentwood High School. Enjoy the fairly flat, fast route through City of Covington neighborhoods. Commemorative awards for all 5K &10K finishers, and awards for top 3 runners in each age group. Online registration closes 9/10/2018. More details at www.multicare.com/summersendrun. 5K Walk/Run at 6 p.m.; Free Hot Dog Dinner at 7 p.m.; Tree Lighting is at 7:30 p.m.
Purple Light Nights® is the inspiration of the Covington Domestic Violence Task Force, King County , Washington . “Domestic Violence Has NO Place In Our Community”. The Covington Youth Council will be hosting a food drive during this movie event. Please feel free to bring any non-perishable food items to donate! Donations will benefit the Storehouse, one of our local food banks. Enjoy a swim with the lights out and a glowing pool! Pick from one of two spooky sessions and be prepared to have some gouhlishly good fun! Float-in for some holiday fun! Bring the kids for some classical holiday films, games and activities, and a lot of splash! Learn more by clicking here. Live music will kick off the event at 4 p.m. Covington Service clubs will be serving up hot cocoa and cider, popcorn, and cookies and the City of Covington is offering an ornament making craft. The tree lighting is from 5-5:10 p.m. and Santa rides in on a fire truck at 5:30 p.m.
All day long in Covington, the Covington Kiwanis Club is holding additional Hollydaze events including the Reindeer Dash 5K, the Pancake Breakfast, and the Craft Bazaar. Details and times can be found at www.CovingtonHollydaze.com. *Dates/times subject to change. Please check website or Facebook page, or call the Parks and Recreation Department at 253-480-2480 for up-to-date information.